Morio Higaonna was born 25th December 1938, and he began his karate training when he was fourteen. He studied Shorin-Ryu with his father. He was also training with a friend, Tsunetaka Shimabukuro, another Shorin-Ryu stylist. At the age of sixteen he began to train in the Goju-Ryu style on the recommendation of Shimabukuro Sensei. The year was 1955 and the young Higaonna was training in the garden dojo of the late Chojun Miyagi Shihan, his instructor was An´ichi Miyagi Sensei. At that time the training regime was very tough and Higaonna Sensei tells us of the countless times he would practice kata or kakie training with many different opponents until he could no longer move his arms. Anyone who has trained in Okinawa will know that due to the climate this requires tremendous effort. In 1957 the garden dojo moved to a permanent building called the Jundokan. Hiagaonna Sensei continued his training there, five hours every day. After his instructor, Anichi Miyagi Sensei moved away to work on an American oil tanker Higaonna Sensei gained a place at the Takushoku University in Tokyo, it was around this time that the first official Dan grading was organised. Higaonna Sensei was awarded 3rd Dan. The year was 1960. It was in Tokyo that Higaonna Sensei taught at the famous Yoyogi Dojo. Many thousands of students passed through this dojo. Some of the more notable Senseis´ were Ogawa, Todano and Terauchi; from the West, Ernie Brennecke, James Rousseau, Bakkies Laubscher; and from Shotokan Karate, Terry O´Neill. During the late sixties and early seventies Higaonna Sensei began travelling to several of the countries that were practicing Okinawa Goju-Ryu. He was invited to perform a demonstration at the World karate Championships in Paris in 1972 and his reputation as one of the strongest Goju-Ryu practitioners in the world was growing. In 1979 in Poole, England with the help of his senior international instructors the IOGKF was formed. The primary objective of the IOGKF remains the preservation of traditional Goju-Ryu Karate as taught by its founders, and it is now a proud member of the Nihon Kobudo Kyokai (Japan Traditional Martial Arts Association). From that time to this, Higaonna Sensei has maintained his own strict training regime and continues to research the original kata and training methods of Goju-Ryu. 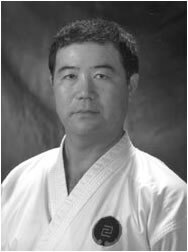 Higaonna Sensei received his 10th Dan certificate, awarded by An´ichi Miyagi Sensei on September 5th, 2007. Higaonna Sensei also received a special certificate signed by Aragaki Shuichi Sensei and Miyagi An´ichi Sensei (both direct students of the founder of Goju-Ryu, Chojun Miyagi Sensei) that recognises him as a student in the direct line descended from Miyagi Chojun Sensei. Miyagi An´chi Sensei and Aragaki Shuichi Sensei both felt that recognizing Morio Higaonna Sensei as part of the Goju-Ryu lineage is important for the future of Goju-Ryu being passed on to future generations. Anyone who has ever met Higaonna Sensei will not only be impressed by his karate ability, but also by his humility and good natured personality. It leaves you with the feeling of having met a true master of karate.